, a learned nonjuring divine and able writer, was of a gentleman’s family in Warwickshire, and was born February 15, 1645. 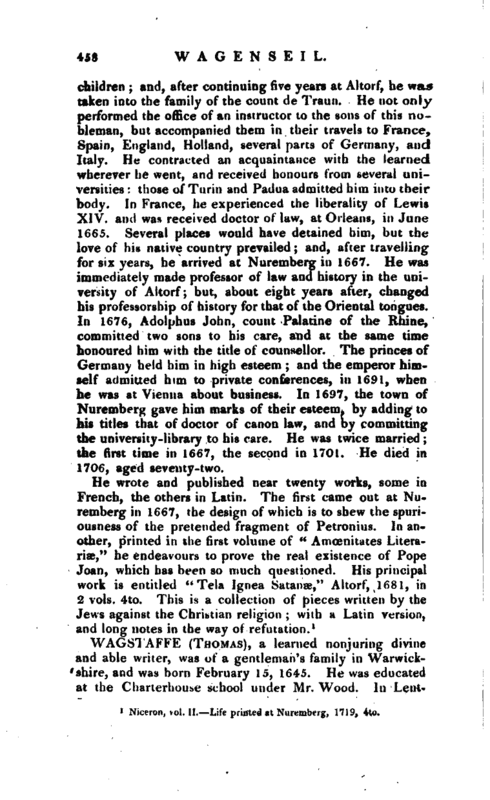 He was educated at the Charterhouse school under Mr. Wood. In | Lent-­term 1660, he was admitted commoner of New-Inn at Oxford, where he took the degree of bachelor of arts October 15, 1664, and that of master June 20, 1G67. He was ordained deacon by Dr. John Hacket, bishop of Lichfield and Coventry, June 6, 1669; and priest by Dr. Joseph Henshaw, bishop of Peterborough, November 19, 1669. He was instituted to the rectory of Martins-Thorpe in the county of Rutland, by Joseph, bishop of Peterborough, November 19, 1669. After that he lived in the family of sir Richard Temple at Stow, in the county of Bucks, and entered upon the curacy of that church April 12, 1676. In December 1684, he was presented by king Charles II. 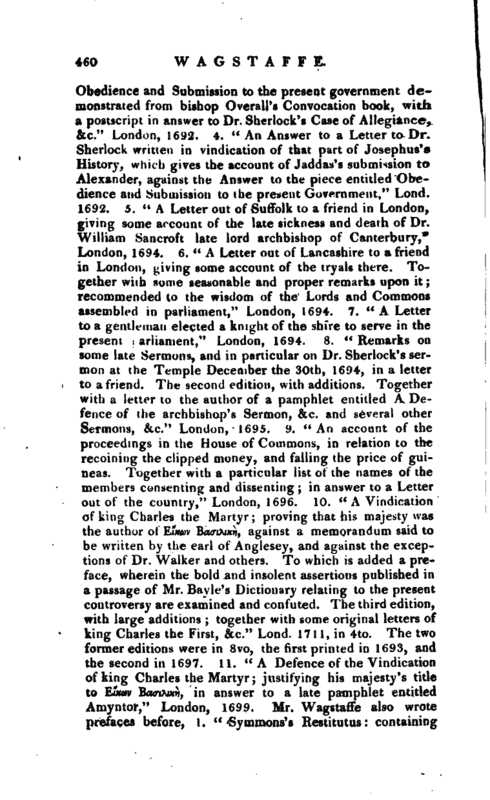 and instituted by William, archbishop of Canterbury, to the chancellorship of the cathedral church of Lichfield, together with the prebendary of Alderwas in the same church. In March 1684 he was presented by Henry, bishop of London, to the rectory of St. Margaret Pattens in London. 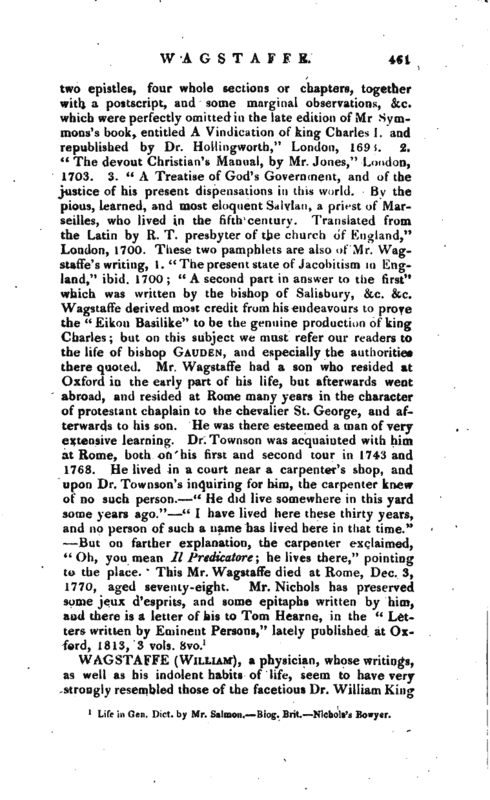 Upon the revolution, being deprived of his preferments for not taking the new oaths, he practised physic for many years afterwards in the City of London with good success, and wore his gown all the while. In February 1693 he vvas consecrated bishop by Dr. William Lloyd, bishop of Norwich, Dr. Francis Turner, bishop of Ely, and Dr. Thomas White, bishop of Peterborough, at the bishop of Peterborough’s lodgings, at the reverend Mr. Giffard’s house at Southgate, at which solemnity Henry earl of Clarendon was present Mr. Wagstaffe was consecrated suffragan of Ipswich, and Dr. Hickes at the same time suffragan of Thetford. 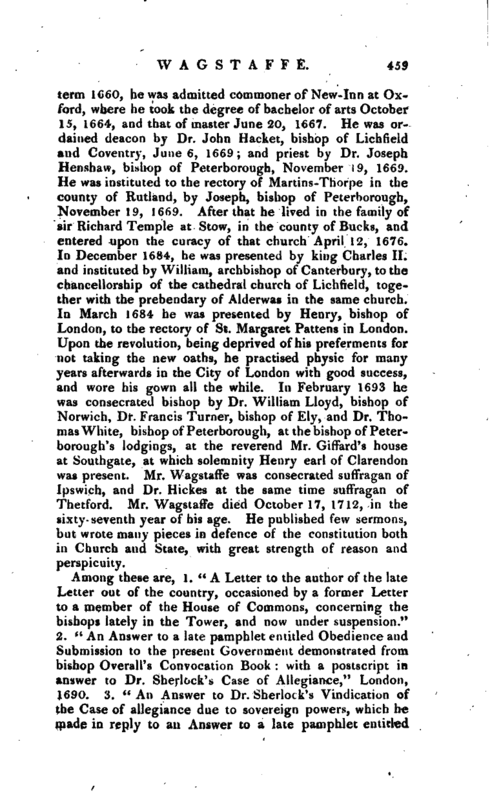 Mr. Wagstaffe died October 17, 1712, in the sixty- seventh year of his age. He published few sermons, but wrote many pieces in defence of the constitution both in Church and State, with great strength of reason and perspicuity. 1 Life in Gen. Dict. by Mr. Salmon. fiiojr. Brit. Nichols’s Bowyer.